W hen you feel like you want to take a swing at your friends, a good "take that" game fits the bill perfectly. Backstab, as its title suggests, gives you the opportunity to destroy your opponents until they're all broken and bankrupt - but only if you play it smart. 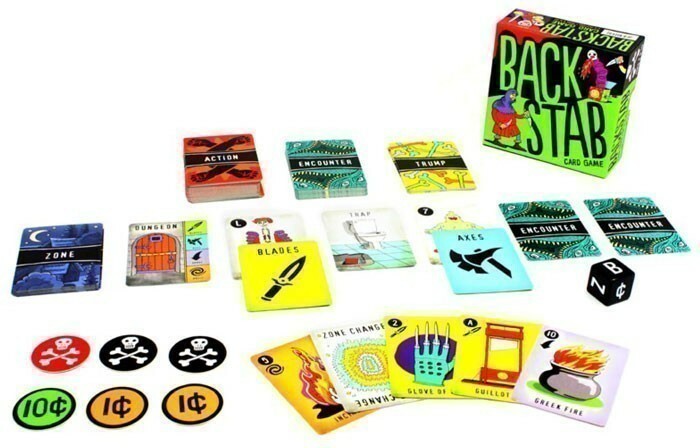 Backstab offers an interesting flavor of gameplay - it combines the experience of a dungeon crawl game like Munchkin with a trick-taking game tike Hearts. In each round, players travel to a different Zone (wasteland, village, ruins, etc.) and encounter various deadly creatures. Each of these Encounter cards contains a number and is also randomly paired with a suit (axe, blade, magic, or range). All players choose an Action card from their hand and simultaneously reveal it. Each Action card contains a number and a suit - if the chosen card trumps the Encounter in its number and/or suit, the player earns a 1-cent coin and draws a new Action card. If multiple players beat the Encounter, the player with the highest-valued card earns an additional coin. The current trump values of each suit are shown on the Zone card from highest to lowest, and the Zone card changes at least once per round. Here's how the backstabbing comes in: one player chooses another player to backstab, and both players choose a card from their hand to reveal simultaneously. The winner of the backstab (the player with the highest valued card) steals a coin from the loser and draws a new Action card, while the loser gets nothing - even the player who initiated the backstab risks losing. Each player can initiate a backstab up to 3 times per round. Players who prefer not to enter into conflict are not immune from backstabs, either - some Encounter cards contain a trap, which forces each player to roll a die and either backstab an opponent, change the Zone, or gain a coin. Gameplay continues in rounds, with a new Zone, new Encounter cards, and a full hand of Action cards each round. If a player has accumulated 25 cents at the end of a round, he is declared the winner. If you like direct interaction, you'll almost certainly enjoy Backstab. We found it to be a highly amusing game that is both unique and addictive - with its simple gameplay, little downtime, and close scores throughout, we found ourselves anxious to play again. The theme is very light, but there is just enough to add excitement and set it apart from basic trick taking games. Each card features its own cartoony artwork of eccentric weapons, horrific villains, etc., that are both humorous and grotesque at the same time. As our favorite game from U.S. Games Systems to date, you should give this one a try.